The car that was seen slowly moving down I-805 due to the driver passing out. Courtesy of KUSI broadcast. A San Diego woman suspected of drunken driving was arrested in Clairemont early Friday after she allegedly passed out behind the wheel, leaving a California Highway Patrol officer to bust out a window on the woman’s vehicle as it slowly rolled forward on Interstate 805, authorities said. 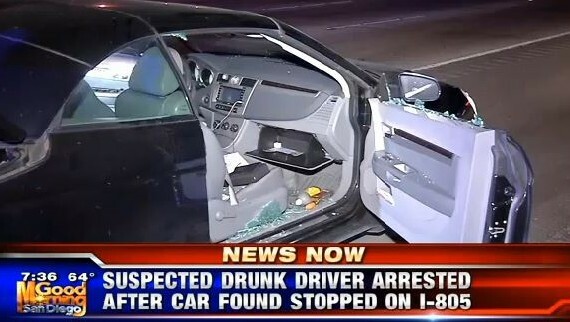 Amber Dlaine McKinney Morgan, 25, was arrested about 1:20 a.m. on suspicion of driving under the influence of alcohol in the area of Interstate 805 and Clairemont Mesa Boulevard, according to the CHP. About 20 minutes earlier, a vehicle described as a black Chrysler Sebring was reported to be blocking the northbound slow lane of the freeway, the CHP said in a statement. Upon arrival, a CHP officer allegedly approached the passenger side of the vehicle and found the driver unresponsive with the engine running, all of the vehicle’s windows rolled up and its doors locked. No injuries were reported. Jail records showed McKinney Morgan was booked into the Las Colinas Women’s Detention Facility shortly after 3 a.m. Bail was set at $2,500 bail, the CHP said.